Dr. Matthew K. Emsley, Analog Devices, Inc.
Abstract: High-bandwidth short-distance communications standards are being developed based on parallel optical interconnect fiber arrays to meet the needs of increasing data rates of inter-chip communication in modern computer architecture.Resonant cavity enhanced photodetectors have been shown to provide the required bandwidth-efficiency product but have remained a challenge to reproduce through commercially available fabrication techniques. In this work, commercially reproducible silicon wafers with a high reflectance buried distributed Bragg reflector (DBR) have been designed and fabricated. Si RCE 12x1 photodetector arrays have been fabricated and packaged with silicon based amplifiers to demonstrate the feasibility of a low-cost monolithic silicon photoreceiver array. 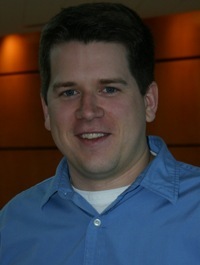 Biography: Matthew K. Emsley (BS'96, MS'00, PhD'03) was born in 1975, in the northern suburbs of Wilmington, Delaware. He graduated from Brandywine High School in 1993 and received his B.S. degree in Electrical Engineering from The Pennsylvania State University in December of 1996, and a M.S. degree in Electrical Engineering from Boston University in May of 2000 for his thesis entitled "Reflecting Silicon-on-Insulator (SOI) Substrates for Optoelectronic Applications." While at Boston University Mr. Emsley was awarded the Electrical and Computer Engineering Chair Fellowship in 1997 and the Outstanding Graduate Teaching Fellow award for 1997-98. In 2001 Matthew was awarded a LEOS Travel Award as well as the H. J. Berman "Future of Light" Prize in Photonics for his poster entitled "Silicon Resonant-Cavity-Enhanced Photodetectors Using Reflecting Silicon on Insulator Substrates" at the annual Boston University Science Day. Dr. Emsley completed his PhD in May of 2003.